Part of the Manitoulin Archipelago, St-Joseph’s Island has been a remote retreat for Northern Ontarians and Michiganders since the turn of the last century. A short kayak ride from one of Frank Lloyd Wright’s only remaining Canadian structures, Gawas cottage perches on the edge of the North Shore between Lake Huron and Lake Superior. Designed for a young family returning to Northern Ontario, the concept of “returning to one’s roots” is a central idea that drives many of the decisions on materiality, building techniques and lifestyle as they pertain to the culture and history of St-Joseph Island. The project is the redevelopment of an existing 2-storey cabin and a new 2nd storey addition cantilevered over the main entry of the cottage. 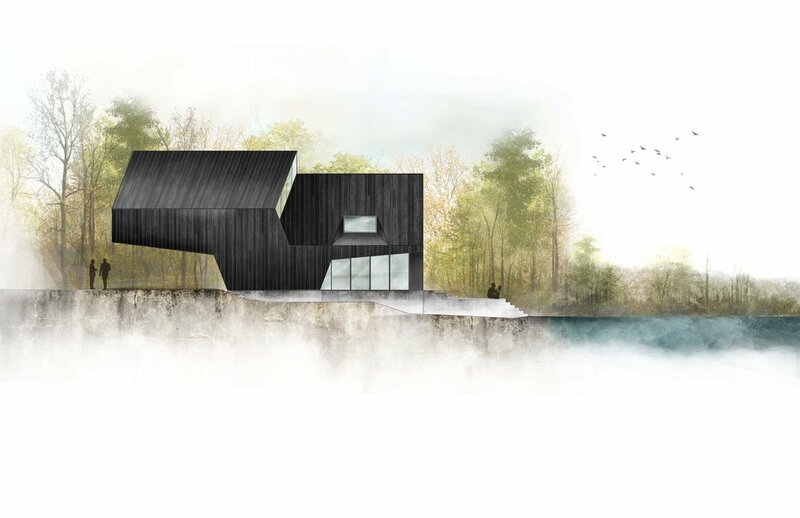 In agreement with the Township, the form and structure of the new cottage were designed to limit the environmental impact of new construction within the water setback by maintaining the existing footprint. The solution — a cantilevered addition — provides two new bedrooms and doubles as a much-needed carport in the winter months. The siting of the cottage is unique: tucked between a sharp cliff and the edge of Gawas Bay, with a steeply angled driveway connecting the cottage to the main road. As one approaches the cottage, the first glimpse is of the cantilever. Entering below the angled second-storey addition, the cottage opens to a wide western view of the Bay and surrounding islands. The result is an intimate and powerful connection between architecture and landscape. 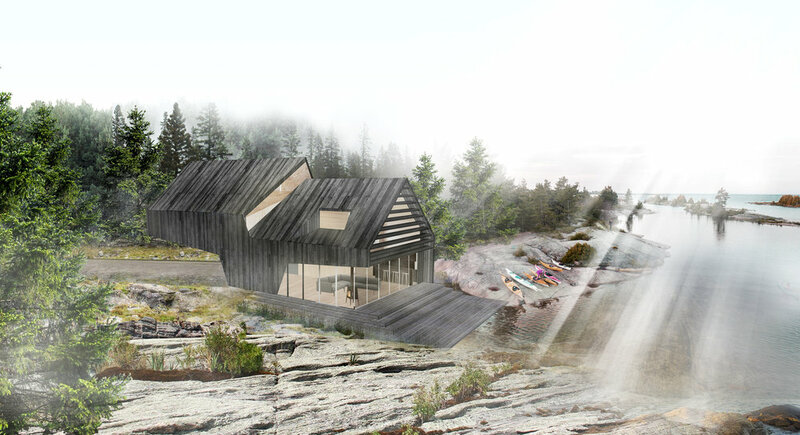 The form and materials of the cottage are inspired by the geological conditions and the vernacular of the hunting and fishing cabins that once peppered the island and surrounding archipelago. Working with a local builder and truss manufacturer, the house is designed to its simplest and most efficient form and takes into consideration the cottage’s unique siting and construction constraints. At the ground level, the open plan includes a kitchen, dining and living space that open seamlessly onto a wide cedar deck, scaled to the size of the interior room, connecting the house to the water’s edge. From this vantage point, the views are endless. From the second storey master bedroom, the strong west light is diffused with horizontal wood fins while deep windows carved into the roofline on the north and south sides room offer views into the surrounding tree canopy. From the smaller bedrooms, wood screens on the east facade provide privacy on the shared balcony while clerestory windows fill the peak of the addition between the new and existing roof lines, resulting in views to the lake and the permeation of sunset light deep into the cottage. The facades and interior are clad in local cedar from the Island. The form of the building recedes into the tree-line. The footprint is small. Warm and understated from the water’s edge, the Gawas cottage is carefully balanced between tradition, modernity and reverence to the archipelago’s natural beauty.